An Orbital ATK Pegasus XL rocket launches into orbit carrying NASA's eight Cyclone Global Navigation Satellite System satellites to study hurricanes from space. The rocket launched Dec. 15, 2016 from an aircraft that took off from the Cape Canaveral Air Force Station in Florida. A rocket fired from a jet plane Thursday (Dec. 15) to launch NASA's latest Earth-observing mission, an 8-satellite mission to study hurricanes like never before. The Cyclone Global Navigation Satellite System (CYGNSS) mission will use radio signals from the GPS satellites to measure the wind speed near the ground in the tropics, between 35 degrees north and 35 degrees south where most hurricanes are born. CYGNSS launched into orbit on an Orbital ATK Pegasus XL rocket at 8:35 a.m. EST (1335 GMT) after being flown into launch position by the L-1011 Stargazer carrier plane. The launch of CYGNSS was delayed since Monday (Dec. 12) when a hydraulic pump glitch prevented a first launch attempt. The need for a spacecraft flight software patch also delayed plans for a Wednesday launch try, NASA officials said. But apparently it was worth the wait. The eight satellites made a smooth trip into orbit and ended up exactly where the mission's science team hoped. "It's right on the money," said Chris Ruf, CYGNSS principal investigator and a professor of Atmospheric Sciences and Electrical Engineering at the University of Michigan. "We'll start getting our science data early next week." An artist's illustration of one of eight Cyclone Global Navigation Satellite System (CYGNSS) satellites in orbit as part of a novel hurricane-tracking mission by NASA. NASA used the plane – once an airliner – to launch the satellite from Florida's Cape Canaveral Air Force Station because it was cheaper than a conventional, vertical launch, said Christine Bonniksen, CYGNSS program executive at NASA. Bryan Baldwin, Pegasus launch vehicle program manager with Orbital ATK, noted that Pegasus rockets have been used successfully many times. Another plus was the L-1011's twin hull, which is shaped in such a way that rockets are easier to fit to the plane. At the pilots command, the Pegasus rocket engines fired. 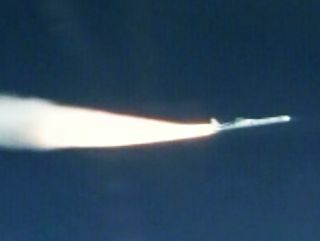 Soon after the second stage separated, before the faring opened up. After that the third stage fired for about 70 seconds to circularize the orbit. At that point the satellites started separating in pairs, about 14 minutes into the flight. The $157 million CYGNSS mission involves eight small satellites, which will orbit the Earth at an altitude of about 316 miles (508 kilometers), inclined at 35 degrees. Each spacecraft will look for GPS signals reflected from the oceans. As wind blows over the water the reflected signal scatters, allowing scientists to calculate the wind speed. "Hurricane forecasts have been steadily improving," Ruf said during a press conference on Saturday. "Forecasts of intensity have not improved anywhere near as much." Unlike current satellites, CYGNSS can "see" wind speed through rain, which current spacecraft aren't really designed to do, Ruf said. He added that the planes used to fly into hurricanes give finer-grained measurements of wind speed, along with a storm's vertical structure. But airplanes need to make multiple flights to get good coverage. The satellites have no propulsion. Instead to adjust their distance from each other and avoid "lapping" as they go around the Earth, they are able to re-orient themselves so that the flat solar panels will face in different directions. This "drag maneuver" will slow them down, because even in low Earth orbit there is a tiny amount of air, said Aaron Ridley, a CYGNSS scientist with the University of Michigan. CYGNSS' planned lifetime is about two years. Mission planners hope it might be extended, depending on the condition of the satellites and how good the data they produce is. You can follow us on Twitter @Spacedotcom. We're also on Facebook & Google+. Original story on Space.com.